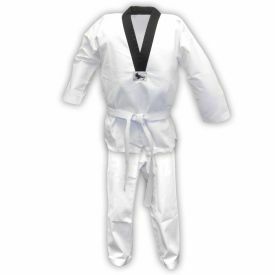 Over recent years, v-neck taekwondo uniforms have grown in popularity with many of the Korean martial art schools throughout the world. Contrary to a traditional karate uniform, a tae kwon do gi has a v-neck style jacket instead of an open wrap-around jacket. This closed jacket style can allow for faster movement without having to worry about the jacket coming undone. You can purchase a v-neck taekwondo uniform in many different styles, weights, and colors, so be sure to ask your instructor which type you need before purchasing. We know that TKD students can be very particular about their uniforms. Taekwondo is a highly active style that can really test the limits of a martial arts uniform when it comes to range of motion and durability. That's why we are proud to offer our selection of lightweight and super middleweight student doboks. 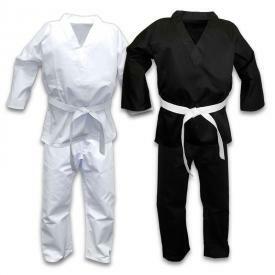 We even offer plus-sizes in the Super Middlweight TKD Uniform. 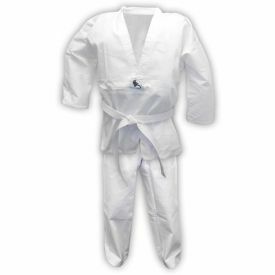 At KarateMart.com, we do our best to bring you a good assortment of high quality tae kwon do uniforms at great prices. 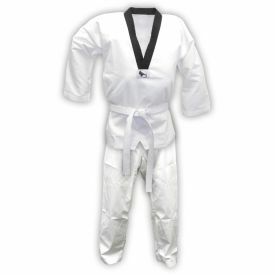 We are also working on increasing our different lines of taekwondo gis to include additional brands and weight options. If you have any questions about our uniforms, please don't hesitate to give us a call, because our customer service team is here to help. Please contact us via email at service@KarateMart.com or phone at 1-800-977-6928 if you need any help with you taekwondo uniform purchase.